With over half a million products shipped, we know a thing or two about bedwetting and incontinence problems. Made by healthcare professionals for healthcare professionals, we intimately understand the needs of caregivers and their families. Our products are proven and successful. 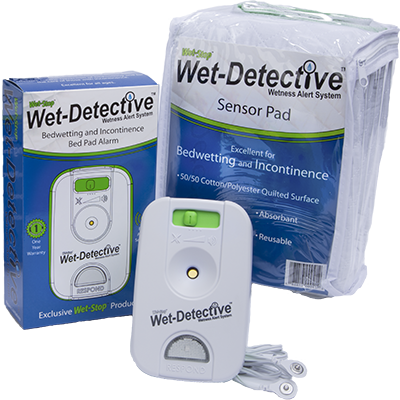 The Wet-Detective alarm system is an excellent product used in incontinence management. For those who are taking care of a loved one at home, the Wet-Detective can help. With four different alarm settings, the Wet-Detective is an effective and easy-to-use product. There are no wires to wear — just place the pad on the bed, attach the included cable to the pad and alarm unit, rest the alarm unit on a side table or clip to the bed skirt, and turn it on to the desired alarm style. you are a busy healthcare professional who takes care of aging adults, the Wet-Detective is an ideal solution to detecting incontinence. Whether you need those you care for to be awakened by the alarm or you just need to be silently notified via the LED respond light, the Wet-Detective is flexible to your needs.